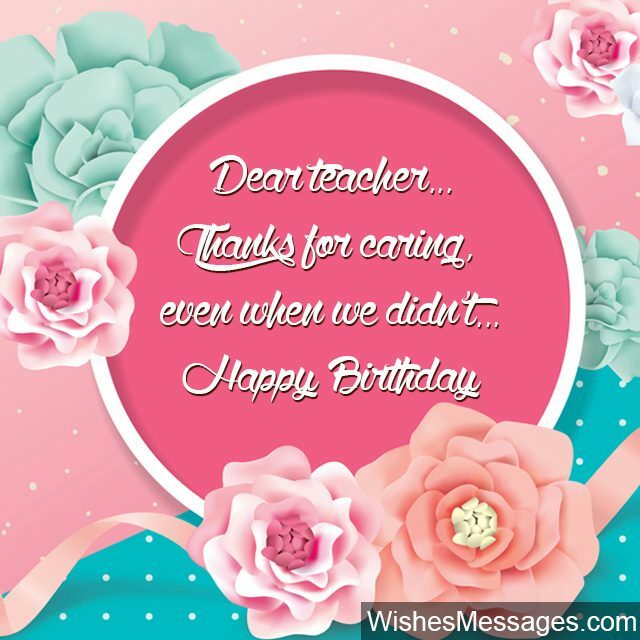 Birthday Wishes for Teachers: Take ideas from these funny messages, cute quotes and inspirational greetings to write something sweet on your teacher’s birthday card. If it is for your favorite teacher, a couple of guys and girls or even the whole class can pool in some money to buy a nice gift. You can take it to the next level by getting everyone to sing Happy Birthday when your teacher walks in. No matter how annoying your teachers or professors seem, always remember that it can often be a thankless job. It takes a selfless love, for education and giving children a brighter future, is what keeps them going. Live it up and make it a memory that your teacher remembers for years to come. 1) Teachers are the miracles that put life into the cold walls of schools. Happy birthday. 2) By teaching me math, you didn’t just teach me how to add numbers but also how to add value to my life. Happy birthday teacher. 3) In everyone’s life there is one teacher whose words remain engraved in the heart and soul for a lifetime. For me, it’s you. Happy birthday. 4) Great teachers are torchbearers of how far education and humanity have come through the pages of history. Happy birthday to one such torchbearer. 5) I take pride in having learnt from a teacher like you because, now my life has a purpose and a cause. Happy birthday. 6) Dear teacher… to show how you have changed my entire life’s view, I want to say that when I grow up I want to be just like you. Happy birthday. 7) Truth be told, being a student is easier than being a teacher… at least your grades don’t depend on the grades that someone else gets. Happy birthday. 8) Since you tolerate our antics all year round, today we will do everything you say without a single frown. Happy birthday teacher. 9) Good teachers give more than just education. They impart the confidence that students need to be successful in life. Thanks for being one such teacher. Happy birthday. 10) May life give you nothing but the best it has to offer – which is exactly what you have given us as our teacher. Happy birthday. 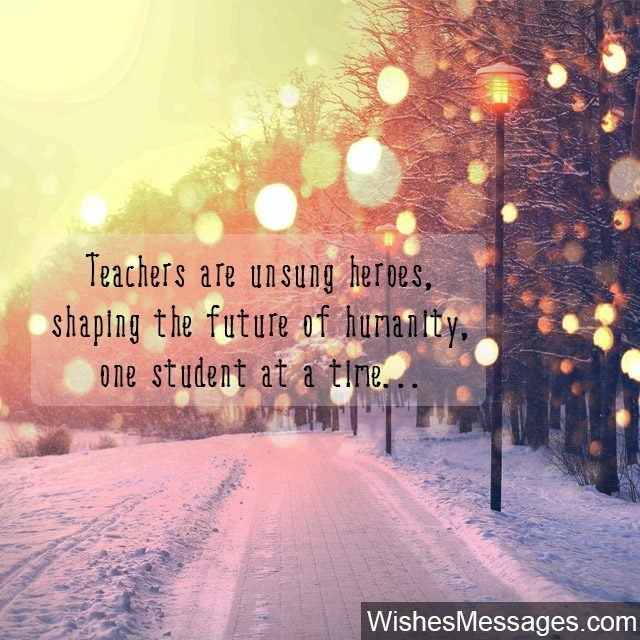 11) Teachers are unsung heroes… shaping the future of humanity, one student at a time. Happy birthday. 12) Do you know what motivation, inspiration, enthusiasm and encouragement have in common? We get all of them from you. 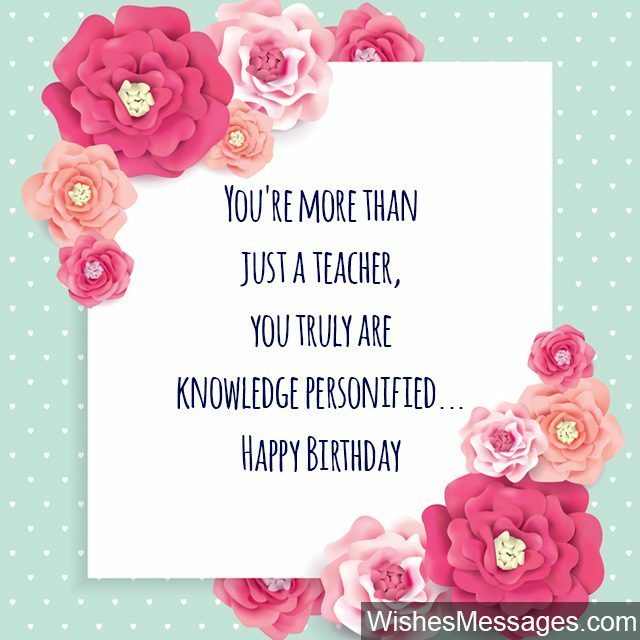 Happy birthday to the teacher who inspires us to be better every day. 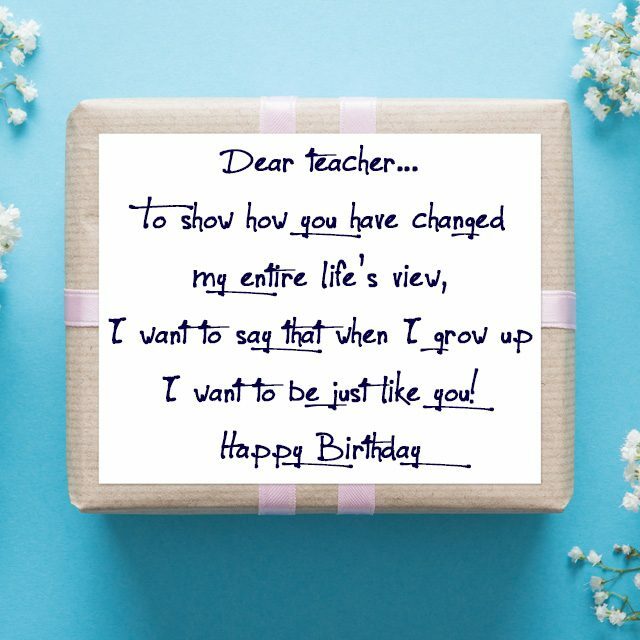 13) Dear teacher… we got you a small gift for your birthday, but it is incomparable to the gift that you give us every day. Education and knowledge are the priceless presents you bestow on us, even though there isn’t a single day when we don’t create a fuss. Happy birthday. 14) You teach us math, now let us teach you how to party. Happy birthday. 15) Today is the one day of the year when you are officially allowed to ask us to stop being naughty and annoying. Happy birthday to the teacher who tolerates us and despite all the drama, never stops smiling. 16) Dear teacher… Thanks for caring, even when we didn’t. Happy birthday. 17) Some people say that teachers are guides but we believe that nurturing teachers like you are our second parents. Thanks for making our classroom feel like our second home. Happy birthday. 18) Sometimes the stuff we learn in class every day is exciting. Sometimes with all the homework, things get really dull and boring. But all that doesn’t matter because as a teacher you are just amazing. Happy birthday. 19) Apart from the awesome parties and awesome friends, I will have happy memories of college because of an awesome professor like you. Happy birthday. 20) Dear teacher… you tirelessly put up with my silly mistakes, tolerate my bad behavior and succumb to my crazy tantrums in school. You should be given an award because even my parents can’t handle all that without losing their cool. Happy birthday. 21) You are more than just a teacher, you truly are knowledge personified. Happy Birthday. 22) Everyone can teach lessons that are INSIDE books but only gifted teachers like you can subtly weave them along with other life-lessons from OUTSIDE the books. Happy birthday. 23) On your birthday, we all have just one wish – we hope to fail so that we can take your class again next year. 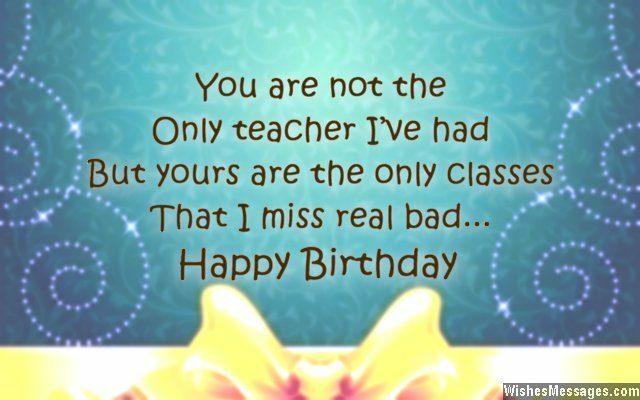 Happy birthday to the most awesome teacher ever. 24) History class would have been a sleeping pill if it weren’t for your uber cool story telling ways. Happy birthday to the teacher who can make light up even the dullest of days. 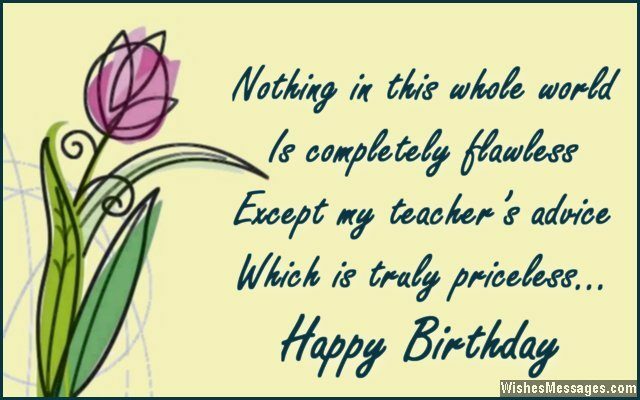 25) Dear teacher… since it is your birthday today, the whole class encourages you to take the day off. Happy birthday. 26) You are not the only teacher I’ve had, but yours are the only classes that I miss real bad. Happy birthday. 27) A great teacher does not crack down rebellion in a student, but channels it in the right way. And you did just that. Thank you and happy birthday. 28) I always thought that being a musician, actor or an astronaut would be the coolest thing to do. But I realize that none of that would be possible if there weren’t teachers like you. Happy birthday. 29) How can I forget the birthday of the woman who never forgot mine when I was young? Happy birthday teacher. 30) For a person who taught me how to read, write and talk, remembering her birthday is not even an ounce of what she did for me. Happy birthday. 31) Nothing in this whole world is completely flawless, except my teacher’s advice which is truly priceless. Happy birthday. 32) Happy birthday to my first mentor, first idol and first hero. Dear teacher… I will always look up to you. 33) Remembering birthdays unfailingly is just one of the hundreds of courtesies and etiquette that you have taught me as my teacher. Happy birthday. 34) I wouldn’t just call you the best teacher in the world, universe or solar system – but the best teacher in all the galaxies out there. Happy birthday. 35) The fact that I remember your birthday even after so many years of finishing high school is proof of my admiration and respect for you. Happy birthday. 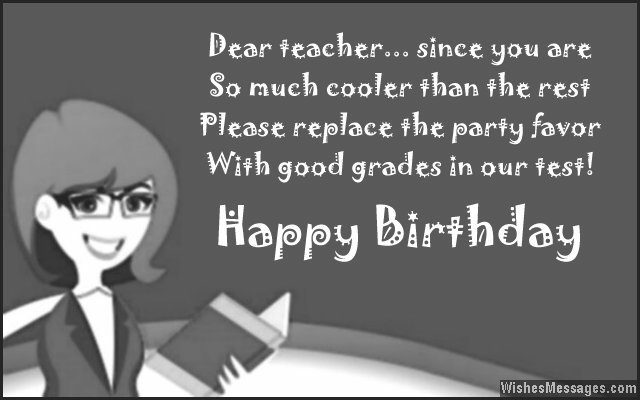 36) Dear teacher… since you are so much cooler than the rest, please replace the party favor with good grades in my test? Happy birthday. 37) All teachers can make students learn how to read books and understand what’s written in them. But only a select few like you can teach students how to implement all that in real life. Happy birthday. 38) You make rimless spectacles, vintage trench coats, neck scarves and ink pens looks chic and fashionable. Happy birthday to the coolest teacher ever. 39) You are the best TEACHER in the world because you are Tremendous Exemplary Admirable Commendable Honorable Excellent and Respectable. Happy birthday. 40) Technology can come and go, but nothing can replace the warmth and empathy of a good teacher. Happy birthday.